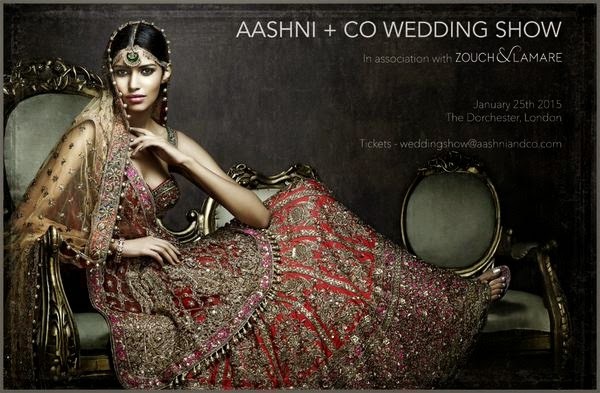 A date for your diary in 2015, London's Indian designerwear store Aashni and Co are holding a wedding exhibition at the Dorchester Hotel on Sunday the 25th January. This event is planning to be more than your average asian wedding show, with a selection of India's top designers being there in person to showcase their collections. I don't have a confirmed list of which designers will be attending, but bridal collections from the following designers will be on show: Anamika Khanna, Arpita Mehta, Manish Malhotra, Rimple and Harpreet Narula, Sabyasachi, Shehlaa, Tarun Tahiliani and Varun Bahl. Tickets for the show are priced at £30 each and that fee can be redeemed against purchases made from Aashni and Co on the day. I really like the collections stocked by Aashni and Co and I'm making plans to attend this exhibition, although I get the impression that "ordinary" members of the public aren't really the target demographic for this event. "We will be sending out invites to in-store clients, celebrities, key social figures, wives of famous industrialists and of course the media and the press. Anyone can attend the show by buying a ticket available for a minimal amount for the chance to meet the most visionary Indian designers. We are expecting a gathering of around 1000 people"
I haven't visited the store myself, but in my communications with Aashni and Co the impression I got hasn't been great. I first contacted them last month when I was writing about the copy Sabyasachi jackets being sold by other London retailers. I know Aashni & Co are an official stockist of Sabyasachi and I was hoping they could give me a price for the original design to compare with the prices being charged for the copies. "This is something that can be ordered through us, however we cannot give out prices. If you do have any enquiries, please direct them to us." Ok...so not everyone wants to give their prices out by email, that's fine. "We are having a Wedding show for our Brides. We will be having designers from all over India showcasing their collections." That's literally all the email said, no date, no location, no indication that the event was open to the public and no information on tickets. Great way to make a potential customer feel alienated and like they're not good enough to shop at your store! Despite all this, I'm still planning to attend the wedding show as the opportunity to potentially meet some of India's top designers and see their collections up close is just too good to miss. Here's hoping the welcome from Aashni and Co is better than their email communications so far!